Al dente spaghetti pasta in a zesty meat sauce with onions and tomatoes. meat sauce (water, diced tomatoes in juice [tomatoes, tomato juice, citric acid, calcium chloride], tomato paste, cooked seasoned meat crumbles [beef and pork, water, salt], onions, red bell peppers, modified food starch, romano cheese made from cow's milk [cultured part skimmed cow's milk, salt, enzymes], garlic, sugar, spices, extra virgin olive oil, salt, dried garlic, xanthan gum), cooked enriched spaghetti (water, enriched semolina [durum wheat flour, niacin, ferrous sulfate, thiamine mononitrate, riboflavin, folic acid], carrageenan). contains: milk, wheat. The use and disclosure of information collected on this web site is subject to the Heinz Privacy and Legal Policies. 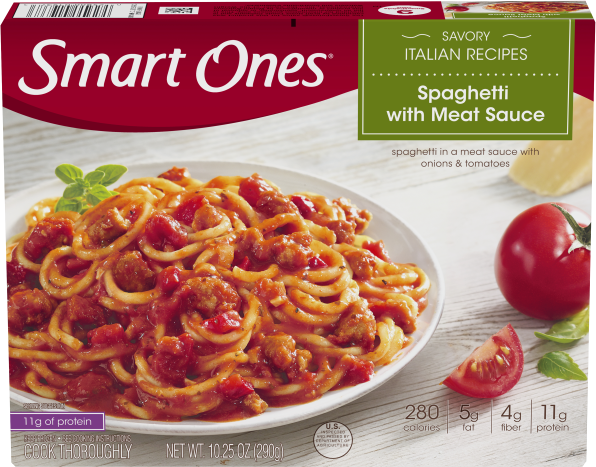 The SmartPoints® value for this product was calculated by Kraft Heinz Foods Company and is provided for information purposes only.